Have you had a hard time finding the correct paddle board? We know of how many products there are to choose from, as we have gone through them all. We have picked the top 5 paddle boards that are appropriate for the ocean. Our goal is to help you pick a model that best satisfies your expectations. 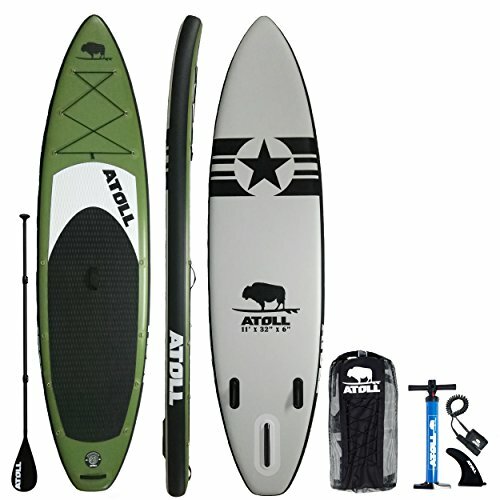 The Atoll model is an 11 feet long, 32 inches wide, and 6 inch thick paddle board made for open oceans. It’s covered in two layers of PVC and EVA foam. 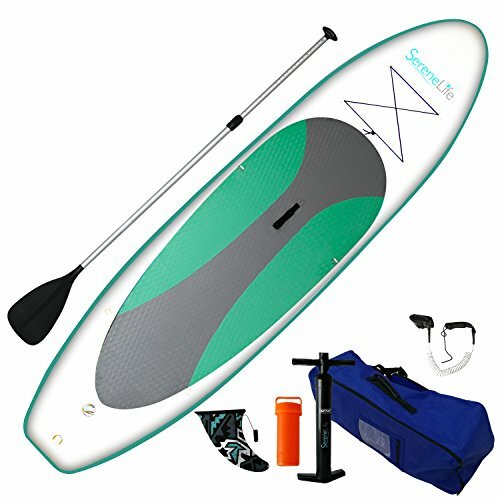 The board includes all the crucial items any person would need, it comes with a 3 piece adjustable paddle nylon blade, a 10-inch poly flex leash, a removable back fin, and lastly, a carrying backpack that’s big enough to store the manual pump. What’s so good about it? This sturdy board was designed to do the job of a hard-board but with the advantages of an iSUP. It has 15 D-rings to attach all your belongings. The model was built for children, adults, and there’s even enough room for pets. The 10-inch center fin allows better control which can be a challenge during strong ocean currents. The board is 40% lighter than other models, making it easy to carry on long walks to the shoreline. The Tower Adventurer 2 is a 10.4 feet long, 32 inches wide, and 6 inches thick paddle board, and it’s the next best choice for ocean SUPs. The model is built from strong materials such as fiber that connects the top and bottom deck to keep it in shape. It’s designed to withstand white water rapids and rocky shores. 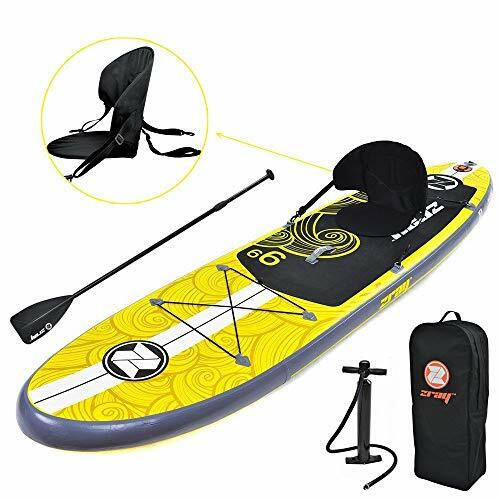 The board includes a 3-PC fiberglass paddle, a high pressure pump, a detachable center fin, a handhold strap, and an additional strap to keep the board in place when rolled up. It’s a great pick for all paddlers, experienced or not. It has a branded diamond grooved deck pad to prevent accidental slips. This model is designed to last a very long time thanks to the military grade PVC and the drop-stitch design. The center fin also helps paddlers have better handling of the board. The model is also a good fit for flatwater sports such as yoga. The Sea Eagle is a 12.6 feet long, 40 inches wide and, 6 inches thick inflatable board designed for fishing lovers. It’s made from a reinforced drop stitch. The board has the largest surface which is convenient for all the fishing gear. It comes with four rod holders which users can access very quickly. This model is built for long hours of comfortable fishing thanks to the swivel seat. This board includes all the essentials a fisherman may need, including two paddles, a storage box, a manual pump, and a repair kit. The board offers stability when making big catches. It comes with a built-in ruler for on-board fish measurements. Another advantage is that users have the option of attaching a motor in order to reach better fishing spots. It comes with various handles for easier side transportation. The Zray Fs7 is an 11 feet long, 32 inches wide and, 6 inches thick paddle board that can handle small waves, river runs, and flat waters. The model was built to give users the feeling of a hardboard. This board has a large deck which allows you to move freely with great stability. It was designed with UAL technology and a super reinforced drop stitch. 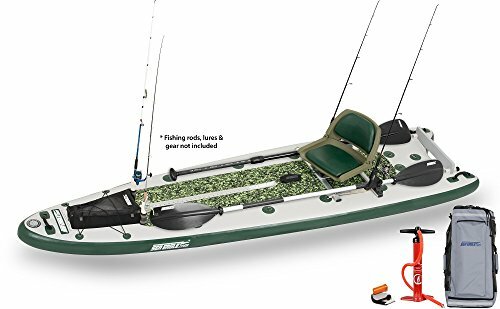 It includes everything you need, it comes with a manual pump, an aluminum paddle, 3 fins, a waterproof phone case, and a backpack. This board makes an appropriate pick for fishermen as well. It comes with multiple D-rings. A cooler can be attached and then used as back support. The model comes with elastic bungee straps to secure other equipment. The assembling of the board takes up to 10 minutes. When the board is fully deflated, it can be rolled up in the backpack for ease of transportation. The SereneLife is a 10 feet long, 30 inches wide, and 6 inches thick inflatable stand-up paddle board that can be enjoyed by kids, teens, and adults. The model has a great wide area which helps users obtain greater balance and stability. It has a rubber soft deck, that prevents accidental slips. The board is a great pick for both beginners and experts. 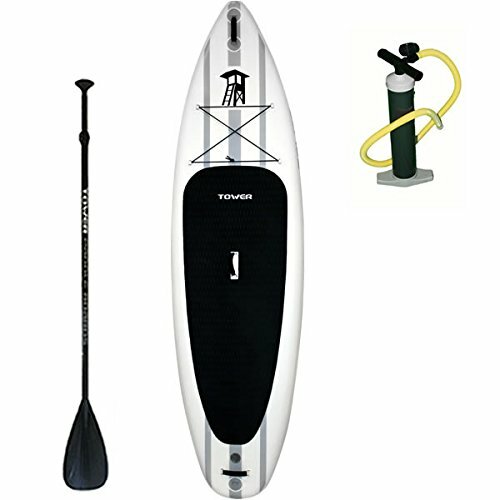 The paddle board includes all the essentials, it comes with an adjustable aluminum paddle, a coiled ankle leash, and a manual pump. For storage convenience, the board includes an elastic strap to keep it in place; as well as a carrying bag. It comes with two small fins and a third one which is removable. With all three fins, users have greater steering abilities, and can achieve a faster speed. The board has front bungee cords for on-board storage. It also has multiple D-rings for extra attachments. It has a carrying handle in the center for side holding. Downwind paddling is quite easy, as not much effort is required. Users usually prefer downwind paddling as it allows them to have better control of their board. It also depends on how far away from shore you are planning to go. On the other hand, upwind paddling requires a lot more energy. When paddling on the ocean, it’s most likely for users to encounter upwind paddling because of the waves. Other factors paddlers must consider are speed and positioning. You should stand closer to the nose of the paddle board if you want to lose wind resistance. When the nose drops down, you will feel as the speed decreases. The current can eventually get you quite far from the shore so being able to decrease the speed of the board is very important. If you’re a beginner, it’s necessary you learn how to stop the board as you may not be prepared for paddling with strong winds. In situations, you may also need to do on-board repairing, which isn’t ideal, but it means that you will need to slow down. The key is to go straight up the wind, not a little bit to the left or right, as this can make paddling difficult. This skill is necessary if you don’t want to get sidetracked. It also takes a lot more energy because you’ll have to do more strokes. The waves are a big factor too. Paddleboards for this type of weather tend to be wider which require greater balance from the user. In this case, beginners might have a harder time learning with big waves, as they don’t have their balance figured out yet. With all the different paddle boards out on the market, people tend to get confused. There are certain specifications a SUP should have for ocean paddling. For starters, the waves are going to be crashing against the board which could throw you off your balance. So our recommendation is to look for a board with a wider deck for greater stability. Typically, boards for ocean paddling are longer than boards for other activities. This type of design is to ensure the board goes faster, and it makes the paddling smoother. Balance is a crucial skill every paddler should be able to control, considering the strong waves they can encounter. As mentioned above, the speed is another factor to consider. Users should look for a paddle board with a surf rocker (nose) that’s sharper, in order to perform nose riding. Since you will deal with a lot of waves and potentially exhausting upwind paddling, a surf rocker tip will help get you over waves with as least of an impact to your speed as possible. Can You Paddleboard Without a Fin? Some of these boards don’t come with fins, and that’s definitely a disadvantage for ocean paddling since the board would turn radically with every stroke. Paddling in oceans is quite different from doing so in rivers or flat waters. It’s quite easy to get sidetracked because of the waves and wind. When going upwind, it’s important to go straight forward. Fins help you paddle in a straighter position and you get better control on the board. Our recommendation for an enjoyable experience is to look for a board with fins, the center removable fin is always a plus. Are These Paddle Boards Appropriate for Fishing? Fishing paddle boards need specific features that not all boards have. Our top recommendation for a fishing paddle board is the Sea Eagle FishSUP. It’s also important that the board is big enough for the fisher to be able to change their position, as they can have many rods facing different directions and they need to reach it quickly. There are also extra features like having a built-in ruler. This add-on detail can be great for those of you that do fishing as a hobby because you can measure your catches on-board. Everyone fishes differently. Some prefer to take a lot of equipment, and others find it easier to go with the most crucial items. So it’s really up to every user to decide which paddle board is best for fishing. Every paddle board is designed differently depending on the activity. This should be easy to figure out by having a look at the features. The shape of the board can allow you to spend an enjoyable time practicing new tricks or positions, if picked correctly. We hope you have found this inflatable ocean paddle board review helpful. Hopefully you have learned a few things you didn’t know about in the Buyer’s Guide. The five boards above are all great options for ocean paddling. One is more suitable than the other for fishing or touring, but the use is up to you. All in all, we hope to have accomplished our goal of helping you.